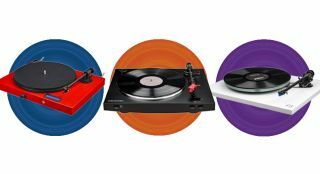 3 of the best 21st century turntable systems | What Hi-Fi? The vinyl love-in shows no signs of abating, and that’s a good thing in our book. But to the newcomer, joining the revolution can be a somewhat complicated process - and in the age of Bluetooth, multi-room and smartphone-based listening, the format also seems rather inflexible. Because it is. But the good news is: going analogue doesn’t have to be complicated, and it can be integrated into a next-gen hi-fi. That's where we come in. Here we’ve built three complete, turntable-based systems that are a bit of a departure from what you might expect. There’s the modern take on the all-in-one music centre, a vinyl-to-Sonos solution, and a full separates system that will let you take your records with you wherever you go. Of course, if it’s a meat-and-two-veg vinyl system you’re after, we’ve got that covered, too - but for something a bit different, with a modern twist, read on. One of the biggest turnoffs for those looking to go vinyl for the first time is the sheer number of components required. The turntable itself, usually a phono stage, a stereo amp, the cables running between everything - it’s a rather daunting proposition. The solution is the Pro-Ject Juke Box E.
It may look like a normal turntable, but within its glossy, compact chassis is a phono stage and complete 25W stereo amplifier. It even has a built-in Bluetooth receiver, so you can mix up your analogue enjoyment with some Spotify streaming. All you need to add to the Juke Box E is a pair of speakers and, if space and money are at a premium, the lively Dali Spektor 1s are an excellent choice. As a complete system, this is an absolute joy at an affordable price. Also consider: Dali Spektor 2 - spend a few more quid to level up to the bigger, more full-bodied yet still lively and unfussy Dali speakers. You want the lovely, luscious, analogue sound of a record player - but you also want digital music streaming and you want both in every room of the house. Too much to ask? Surprisingly, no. Start with the Audio Technica AT-LP3. Not only is this our favourite turntable under £200, but it also has a built-in phono stage - so it's ready to be connected to any stereo amplifier. The often-overlooked Sonos Connect:Amp isn't quite up there for sound quality compared to more traditional budget amps like the Onkyo A-9010, but it can do a great deal more. When partnered with a pair of speakers as accomplished as the Monitor Audio Bronze 2s, it is capable of producing very good sound. And “a great deal more” includes streaming of practically every music service under the sun, and the most usable and robust multi-room networking around. Pop an LP on the turntable in the lounge and you can listen to it from the voice-controlled Sonos One in your bedroom. Add more Sonos speakers and you can fill the house with sweet analogue music. Also consider: Rega Planar 1 Plus - all the goodness of the Planar 1 with a phono stage built in, this excellent Rega is worth the price jump from the AT-LP3. Whether it’s archiving your precious LPs or taking them with you wherever you go, there’s lots to be said for digitising your vinyl. There are plenty of affordable turntables that can do the job, but they’re often limited by their all-in-one nature. It makes more sense to start with a turntable that simply sounds superb, and offload the ripping responsibilities to a separate unit. We’ve chosen Rega’s Award-winning Planar 3 deck (with Elys 2 cartridge) and Fono Mini A2D phono stage. Plug your computer into this pairing and you can rip your records without loss of quality or character. If you don’t already have a phone (or dedicated portable media player) to enjoy the resulting digital files while on the move, we’d suggest the LG V30. The screen isn’t amazing, but it supports hi-res audio (including DSD files) and sounds great in its own right. The Sennheiser Momentum 2.0 Over-ear headphones are a great partner - not only do they sound excellent, but they’re effortlessly portable and stylish too. Of course, at home you'll want to enjoy your turntable exactly as intended, and the combination of the Cambridge CXA60 amplifier and Fyne Audio F302 speakers will get the best out of the Rega duo. Also consider: Audiolab 6000A - an impressively refined, articulate and spacious performance and a great spread of features prove a decent step up from the Cambridge amp. Also consider: Samsung Galaxy S9+ - swap the LG V30 for this slicker Samsung S9+ that replays all hi-res files and has a stunning screen, too.